Refrigerated deli cases are an essential piece of equipment for sub and sandwich shops, grocery market delis, or any food service establishment that wishes to display their deli products. Designed for use with deli meats and cheeses, deli cases will feature an evaporator located inside the display area, however, there will be no evaporator fan. This setup ensures that the meats and cheeses will retain high moisture levels without shrinkage or drying out. 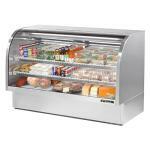 Deli cases come in a vast array of sizes, including countertop height models. In addition to this, you can choose from either a straight glass style or curved glass style when purchasing a new refrigerated deli case at the best wholesale price from our fantastic selection! 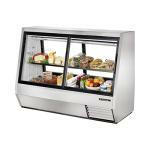 All of our deli cases are manufactured by trusted brands such as Beverage Air, True Refrigeration, and Turbo Air.